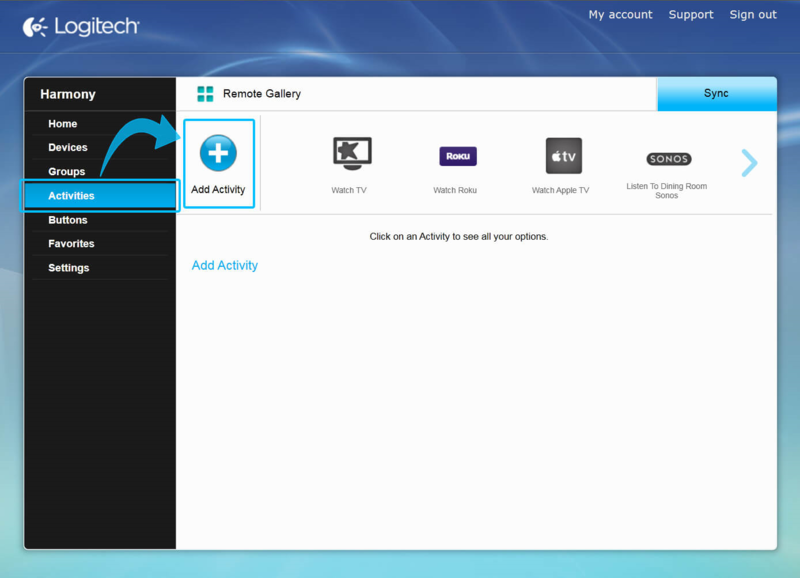 After adding Windows as a device, you'll need to create a Watch PC Activity and configure it to control Windows with your Harmony remote. You'll also need to make some additional changes, which are discussed in this section, to fully control Windows with Harmony. When adding Windows, Harmony will ask you for the manufacturer and model numbers of your television, AV receiver, and other devices that will be included in your Watch PC Activity. 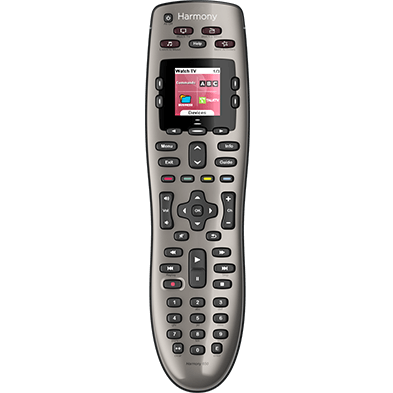 Configure your Activity, allowing it to open, close and control a Windows program using your Harmony remote. When starting your PC Activity for the first time, you must use the Harmony mobile app to initiate Bluetooth pairing. Harmony will appear as Harmony Keyboard in your list of devices when pairing. Select COMPUTER and enter OS WINDOWS, tap > in the upper right-hand corner. 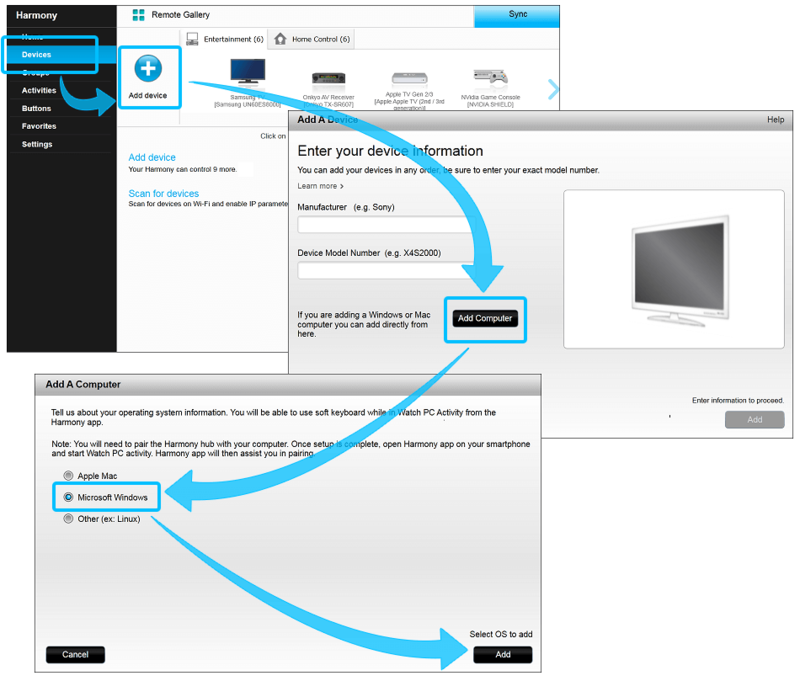 Continue through the process of including devices and selecting your inputs, followed by > in the upper right-hand corner. You'll be prompted to Bluetooth pair with Windows. If you're using an IR receiver, select SKIP at the bottom of the screen. On your PC, create a shortcut to any program you'll like to launch with Harmony and right click it. Select Properties and click the Shortcut key field, setting it to Ctrl+Alt+1, Ctrl+Alt+2 or Ctrl+Alt+3. Add a step at the start of your Windows Activity, selecting the keyboard shortcut for Windows as the new command. You can configure closing Windows with Harmony by customizing a button on your remote to do so (Quit). Once complete, remember to sync your remote. Select the Devices tab, followed by Add device. Select Add Computer, click the Microsoft Windows radio button, then Add. Select the Activities tab on the left and click Add Activity. Select Activity type Watch PC and click Next. You'll be guided through naming your Activity and configuring included devices. Once complete, you'll need to configure a shortcut on Windows for the program you'd like to launch using Harmony. Harmony Smart Keyboard can act as a fully functional Windows PC keyboard, many apps will also allow you to use your mobile device for control functions. Listed below are some popular Windows apps and ways to control them using Harmony. For Windows 8 users, Harmony Smart Keyboard also supports swipe and tab actions. Direction Pad Navigation will navigate Windows. Media keys such as Play, Pause, Stop, Previous Chapter, Next Chapter, Fast-Forward and Rewind commands work. TV keys such as Channel Up, Channel Down commands work. Windows allows you to skip 30 seconds forward or back using the direction left and right arrows. Text entry is possible using Harmony Smart Keyboard or the Harmony mobile app. Learn more about Windows keyboard shortcuts. Direction Pad Navigation will navigate Netflix. Media Keys such as play, pause and fast forward do not control Netflix. Direction Pad Navigation will navigate Hulu. Media Keys such as play, pause and fast forward do not control Hulu. Media Keys such as Play, Pause, Stop, Fast-Forward and Rewind commands work. YouTube allows you to navigate between videos using the Skip Forward and Skip backward commands. Media Keys such as Play, Pause, Stop, Fast-Forward and Rewind commands work. Amazon allows you to move a frame forward or backward using the direction left and right arrows. 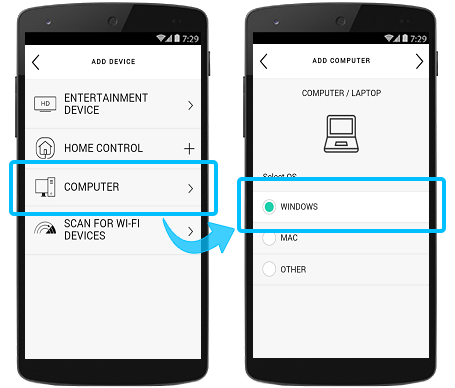 If you're not familiar with adding Bluetooth enabled devices to Windows, follow the steps below to get started. Add a Bluetooth adapter to your computer if it doesn't already have one. You can do this by plugging the adapter into a USB port. Some computers come with a built-in Bluetooth adapter, especially laptops. You might have to turn on the adapter, or use a switch on your laptop to turn it on if your laptop has one. This might not be called a Bluetooth switch. It might be called a wireless switch, or something similar. If you are unsure about how to turn on the Bluetooth adapter or whether your computer has a built-in Bluetooth adapter, check the manual for your computer or the manufacturer's website. Set up the Bluetooth enabled device so that your computer can find it. When a Bluetooth enabled device is in discovery mode, it broadcasts a wireless signal that allows it to be detected by other devices or computers. This is sometimes called pairing mode. When most devices are discoverable, they are also in pairing mode, ready to be paired with your computer. To learn how to make a device discoverable, check the information that came with your device or go to the manufacturer’s website. Methods for making a device discoverable can vary widely from one type of device to the next. Some Bluetooth enabled devices are always in discovery mode. Others, such as most mobile phones, need to be placed in discovery mode by selecting discovery from a software menu or pressing a button on the device. Discovery buttons can be very small and hard to spot, often placed on the bottom of a mouse, keyboard, or similar device. The button may be labeled with the word "connect," or another similar term (e.g., a Bluetooth logo or it may not be labeled at all). 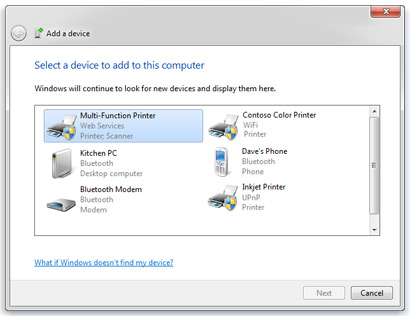 Open Devices and Printers by clicking the Start button, then clicking Devices and Printers. Click the Bluetooth enabled device you want to add to your computer, and then click Next. If you don't see the device you want to add, make sure the device is turned on and discoverable. If you just turned on the device, it may take Windows several seconds for Windows to detect it. Windows might ask you to enter a pairing code (sometimes called a PIN or passcode). Most Bluetooth enabled devices need to be paired with your computer before they can exchange information with each other. To do this, they must exchange protected pairing codes. This means that only the wireless devices you authorize can connect to your computer. On you computer, click the Start button and right click Computer. Select Manage, followed by the Device Manager tab. Double-click Infrared devices (devices are listed alphabetically) and select Enable. 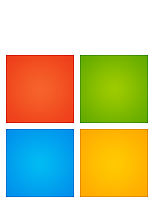 For more information about how Windows integrates with Bluetooth and infrared (IR) devices, please see Microsoft Support. Your computer requires an infrared (IR) receiver in order to receive commands. Harmony does not control computers over IP. 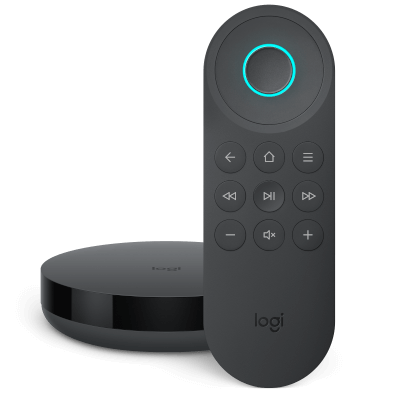 All Harmony commands, navigation and media controls are sent from the Harmony remote, or Harmony Hub (for hub‑based products). If your computer supports Bluetooth Harmony Hub may pair and control Windows in this means. If your computer does not support Bluetooth, the Harmony Smart Keyboard USB receiver may be used as a connection between Harmony Hub and Windows. You will be asked to select your control method and pair (if required) during set up using the Harmony mobile app. All navigation, mouse and text entry controls may be sent using either Bluetooth or the USB receiver.